Special Representative and head of the UN Stabilization Mission in the Democratic Republic of Congo (MONUSCO) Maman Sidikou (centre) greeting children of Oicha, North Kivu. 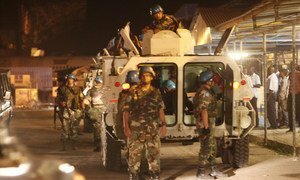 The top United Nations official in the Democratic Republic of Congo (DRC) has expressed deep concern about the increasing political tensions in some parts of the Central African country, urging both the majority and opposition sides to reawaken their patriotism. “The current situation and the dangers weighing upon it need patriotic reawakening both on the part of the majority as well as the opposition, to place the interests of the country above any other consideration,” Maman Sidikou, Special Representative of the Secretary-General and Head of the UN Organization Stabilization Mission in the Democratic Republic of Congo (MONUSCO), said in a press release over the weekend. He noted that increasing the number of judiciary proceedings and actions likely to shrink the political space will only exacerbate the tensions and make it even more difficult to hold the political dialogue insistently called for by President Joseph Kabila. Mr. Sidikou urged strict respect for the rule of law and the fundamental freedoms enshrined in the Constitution. “Only a genuinely inclusive political dialogue, Constitution-abiding, will help Congolese actors to successfully overcome the current challenges, more particularly the ones relating to the electoral process,” he said. Citing Security Council resolution 2277, he said that the UN stands resolutely with the African Union and its appointed facilitator, former Togolese Prime Minister Edem Kodjo, to facilitate the launch of the political talks. The Special Representative further expressed the UN readiness to assist an independent nation electoral commission in organizing free and transparent elections to mark a new step forward in the advancement of the democratic process in the DRC.